This is a traditional Italian specialty that is made each year at Easter time. Every year, without fail, my mom would prepare this pie, and 9 times of out 10, it would be ready to eat on Good Friday, the day that many Catholics abstain from eating meat. Wha??? It would be torturous as I reallllly wanted to have a piece, but couldn’t eat meat. I always asked myself why she had to make the darn pies on Good Friday? This year, we made them earlier in the week, so I could have a piece right away and it didn’t disappoint. 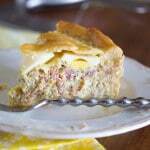 Simply put, these pies are made of eggs, cheese, and meat with copious amounts of black pepper. The ingredients are layered; our version contains slices of hard boiled eggs, which should not have been placed on top as the picture shows…oops. Anyhow, this is sort of like an Italian version of quiche. There are as many versions of these pies as there are pasta sauce recipes. And, every family seems to have their favorite, which of course, is the best in their eyes. I feel the same way about our recipe, which was tweaked by my father. Most people uses multiple kinds of meats, including salami, pepperoni, and prosciutto. My version is slightly different than most others I’ve seen in that it uses only prosciutto, which is dry-cured Italian ham. 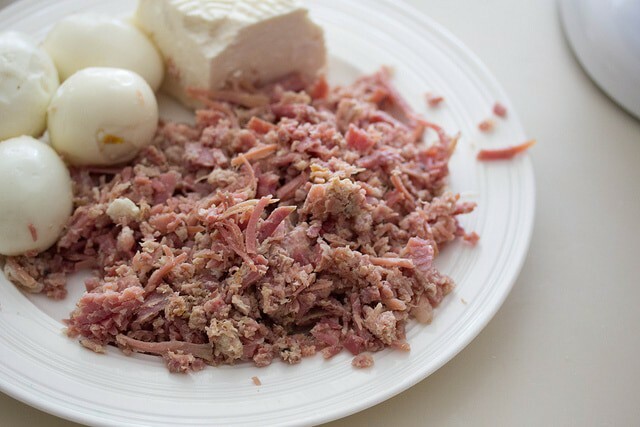 Although the meat is already cooked, we boil it further to lessen the salt content and to soften the meat, so that it can be shredded as shown below. It can also be diced instead to avoid this extra step but I don’t like the feeling of biting into hard chunks of meat that are interspersed in the egg and cheese base. Plus, the water from the cooked meat is reserved to make the pie crust, which is more like a pizza crust than a true pie dough. This year, I finally sat down with my mother to watch her make her version. I eagerly sat in her kitchen, pen and notebook in hand, and watched. She proceeded to add unmeasured amounts of flour, water, milk, oil, etc to make her dough as I sat there bewildered and smiling. See, she does everything by feel and touch. No wonder why these “recipes” never make it to the next generation! Truth be told, my kids and husband don’t eat this pie. Too bad for them but more for me! I only made a very small pie this year, 8 inches, which will last me a while. My mother often freezes this pie also and it still tastes great. 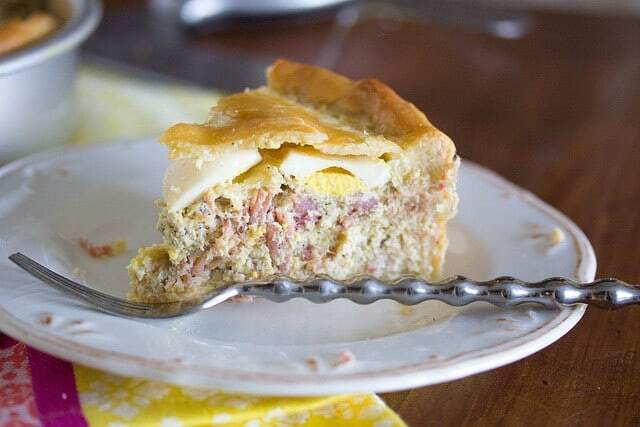 An Italian quiche that is filled with ham, eggs, and cheese, traditionally served on Easter weekend. Combine all ingredients except for flour in large mixing bowl. Add the black pepper and the shredded meat and mix to combine. Grease an 8 inch cake pan. Using 2/3 of the dough, roll out a large circle and insert in into the bottom of the cake pan. Layer and small amount of the egg-meat mixture onto the bottom of the pie and then cover with sliced eggs and Easter cheese/mozzarella. 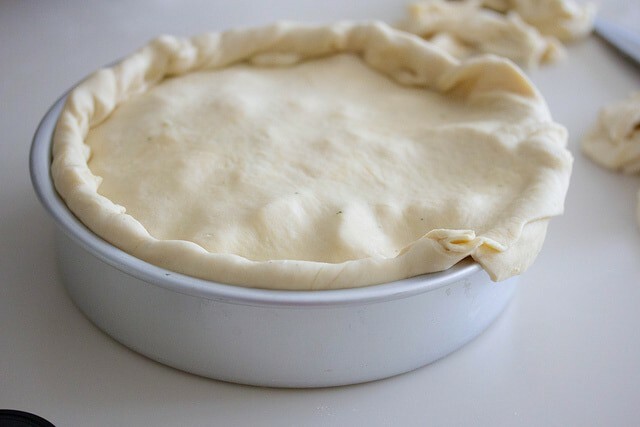 Using the remaining dough, roll out another circle and top the pie. Press the edges of the dough together to seal and roll as shown the in photo above. Cut slits into the top, brush with egg wash and bake for 45 minutes or until golden brown.